It’s Valentine’s Day and that gets me thinking about all the things I love. My incredible family. Our fantastic church. The privilege of blogging about midlife travel. My electric mattress pad warmer. And yes, Edna Mae’s pancakes at The Pioneer Woman Mercantile. 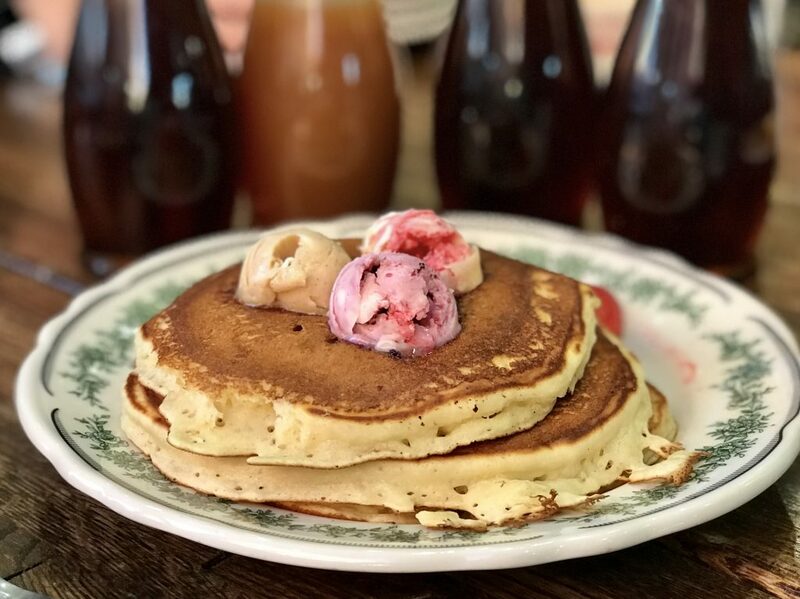 Edna Mae’s Pancakes at The Pioneer Woman Mercantile in Pawhuska, Oklahoma. I fell in love with them last summer when we visited The Mercantile in Pawhuska, Oklahoma, for the first time. I knew from the start we were destined to have a long-term relationship and it has been true love ever since. The menu says the recipe for the tender and delicious pancakes came from Ladd Drummond’s grandmother, Edna Mae. They are served with a trio of flavored butters as well as signature syrups, including aged vanilla and cinnamon, orange zest and clove, and sea salt caramel. Do you see why I love them so much? 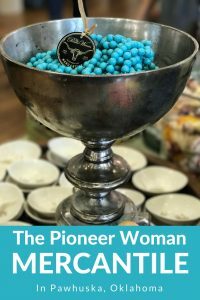 Here are a few more things I just love about The Pioneer Woman Mercantile. 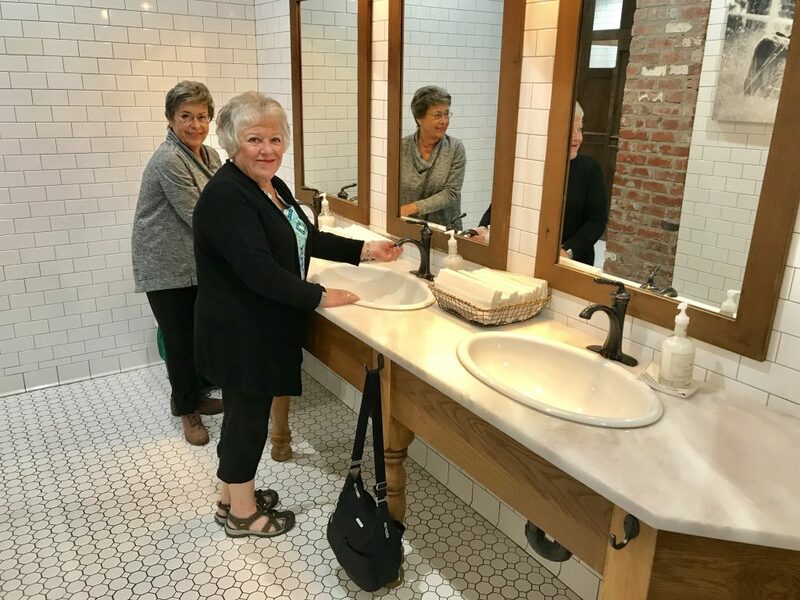 Our moms in the beautiful bathroom at The Pioneer Woman Mercantile in Pawhuska, Oklahoma. The bathrooms at The Mercantile are so beautiful that women actually spend more time taking photographs of the subway tile than they do applying lipstick. And that’s saying something! The bright and roomy restroom has gorgeous tile floors, scented liquid soap, and thick paper towels for drying your hands. There are handy little hooks for hanging your purse while you wash and the bathroom stalls are well stocked with Charmin toilet paper. I dream about this coffee. I had it the first time we visited The Mercantile and every time we’ve been there, since. 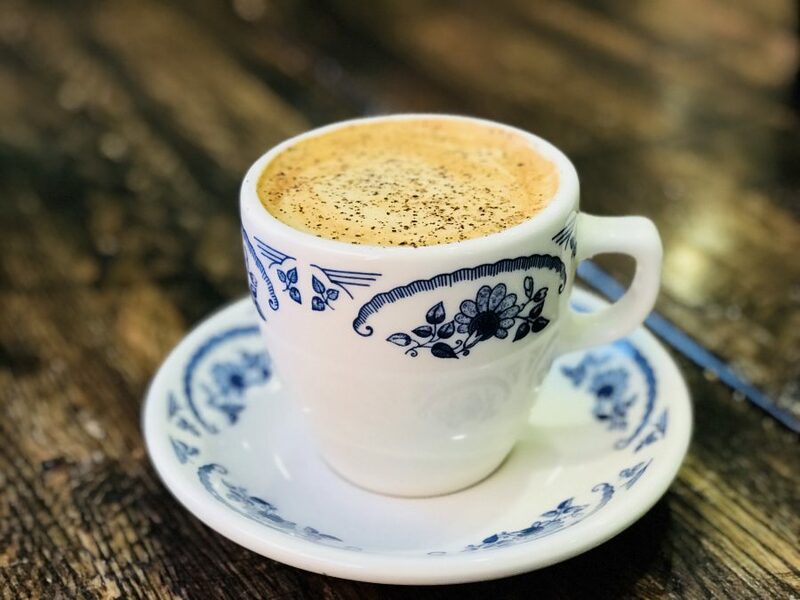 There’s just something wonderful about the way the baristas prepare this hot coffee, served “shot in the dark” style, infused with Sarsaparilla and topped with frothed milk and powdered espresso. The coffee is specially roasted for The Mercantile at Topeca Roastery in Tulsa, Oklahoma, and believe me, it is to die for. Turquoise colored beads at The Pioneer Woman Mercantile in Pawhuska, Oklahoma. 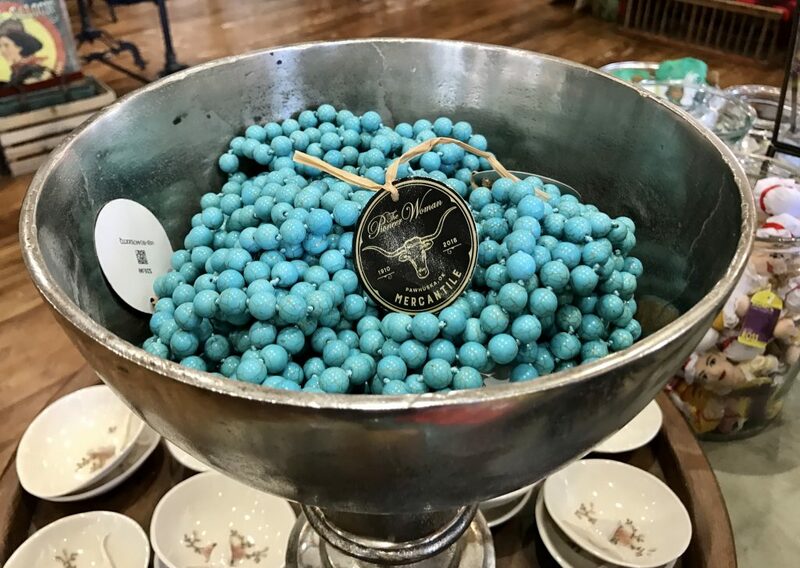 Displayed throughout the store, these turquoise-colored beads are a Pioneer Woman signature item. This beaded necklace is the #1 seller in The Mercantile and seems to go with just about everything. You’ll see them worn by The Mercantile staff with black shirts and jeans and I think they make a great gift for any PW fan. So, plastic wrap might not seem like a big deal to most people. 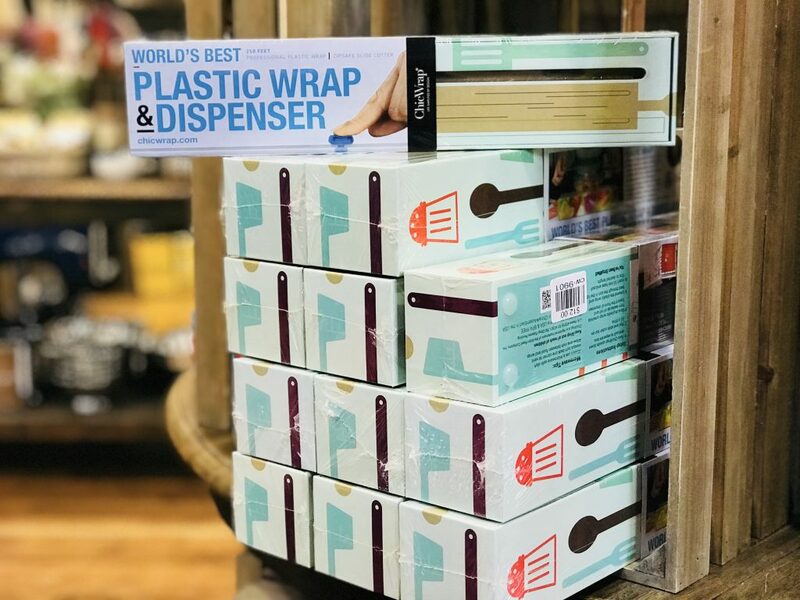 It wasn’t to me, either, until I bought this self-proclaimed “World’s Best” plastic wrap and dispenser at The Mercantile. I am not exaggerating when I say it is life changing. My old beaten up, cardboard Saran Wrap box went right into the trash after I tried this dispenser last summer. For just $12, I completely eliminated the frustration of trying to find the end of the wrap as it clings to the roll or cut off a straight piece across a row of cheaply made metal teeth that slice your hand better than they cut the plastic. Now, I simply measure out my wrap, gently slide a bar across the sturdy, decorative box and … voila … I am happy as a clam. 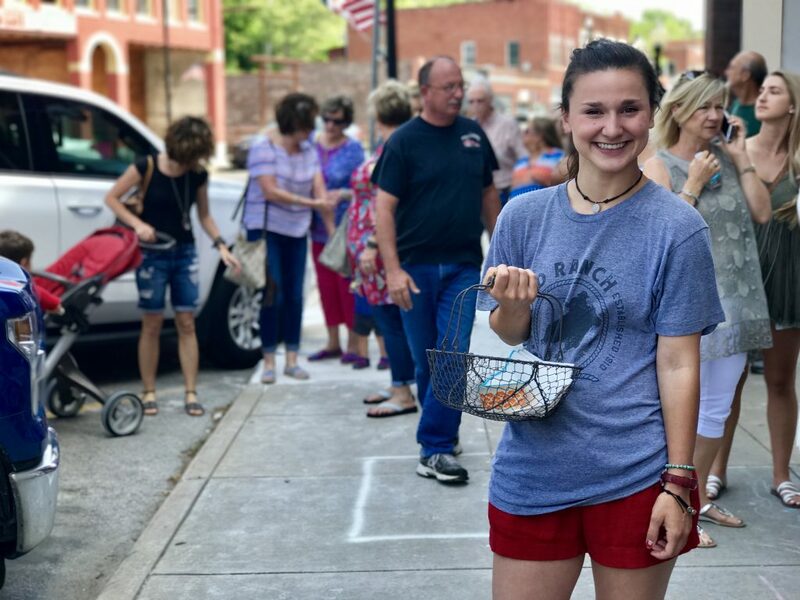 Meg Kane visits with guests outside The Pioneer Woman Mercantile in Pawhuska, Oklahoma. Everyone we’ve met at The Mercantile (and Pawhuska, for that matter) has demonstrated sincere hospitality like we’ve never seen. On our first visit to The Mercantile last summer, we met Meg Kane who was in charge of keeping people in line outside the restaurant on a hot, summer day. She led trivia contests, passed out bottles of water and umbrellas and was just a delight to visit with. 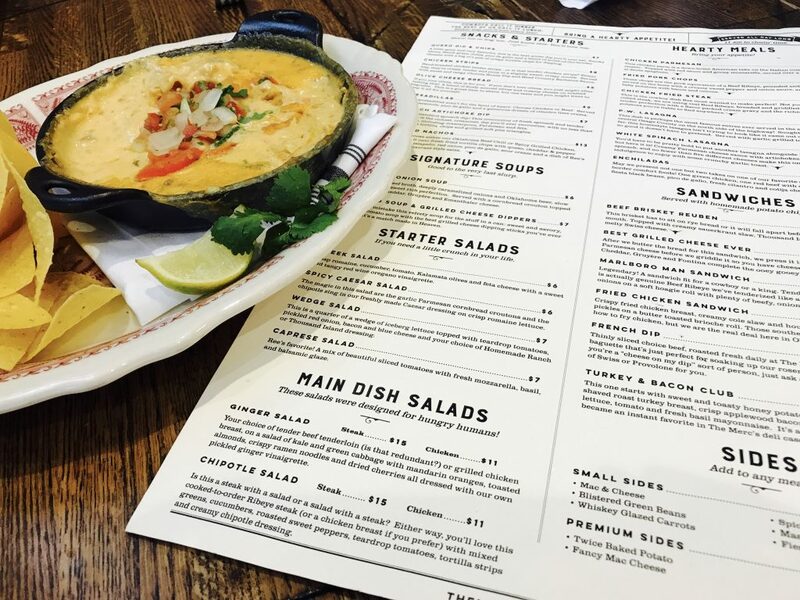 The Mercantile has plenty of staff readily available to answer questions, point you in the right direction, and even make recommendations for the very best dishes on the menu. The Drummonds go above and beyond to make people feel welcome in their hometown, even hiring staff to open the doors for visitors. We’ve traveled all over the world and can honestly say Pawhuska, Oklahoma, has some of the nicest people we’ve ever met. 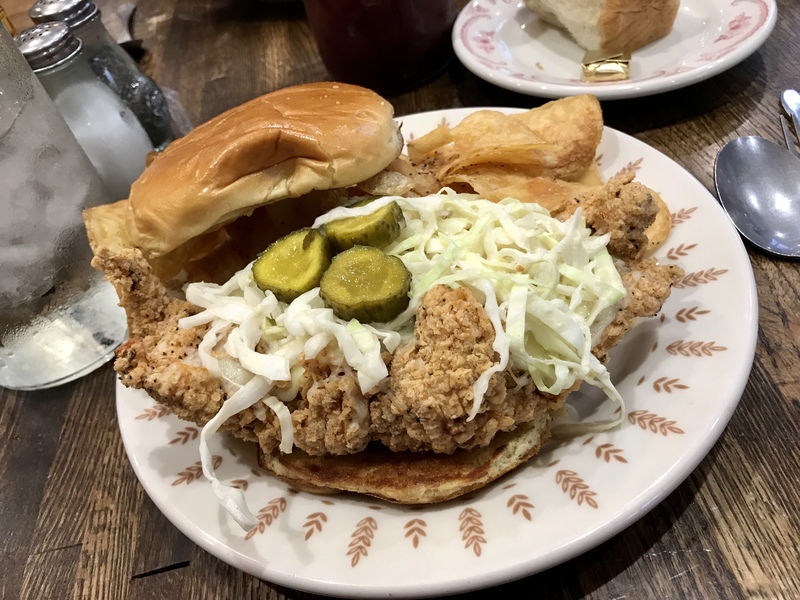 Fried chicken sandwich at The Pioneer Woman Mercantile in Pawhuska, Oklahoma. Hands down, this is the best fried chicken sandwich I’ve ever had. It is a crispy fried chicken breast with white cheddar cheese, honey mustard dressing, and creamy coleslaw on a toasted brioche roll. But my favorite part of this sandwich is the house made bread and butter pickles and I always ask for a few extra on the side. The sandwich is large enough for two meals and is served with homemade potato chips, all for $10! Love this sitting area on the second floor of The Pioneer Woman Mercantile in Pawhuska, Oklahoma. I love everything about the decor at The Mercantile. The brick walls, wood floors, and the uncovered mural in the dining room all give this place a historic feel with modern touches. You’ll be awed by casual seating areas, complete with leather couches, southwestern rugs, and unique tables and chairs. 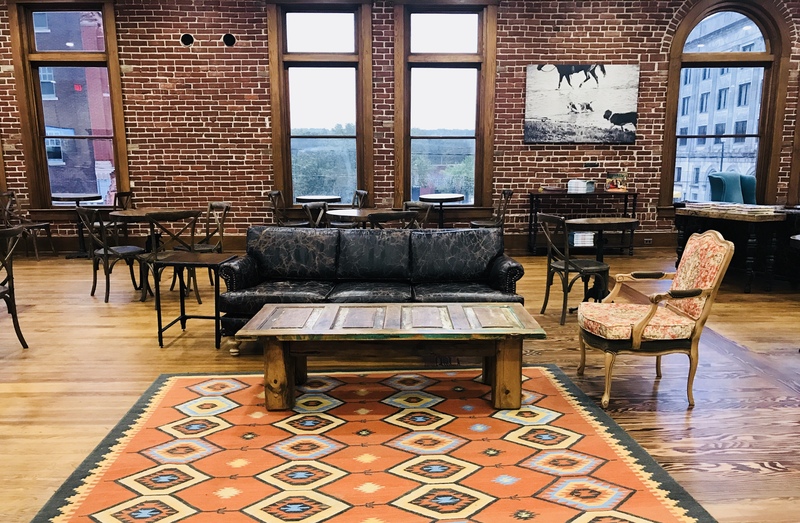 We learned that many of the furnishings (including the furniture and rug in this picture) came from LOREC Ranch home furnishings which now has a showroom full of home decor accessories just north of The Mercantile on Kihekah Street. Stop in and tell Gay hello for us, if you go there. I also love all of the large black and white photographs taken by Ree Drummond of scenes from their family ranch. Seeing pictures of her children when they were little and cattle on the ranch really give the space a personal touch. Flavored tea at The Pioneer Woman Mercantile in Pawhuska, Oklahoma. 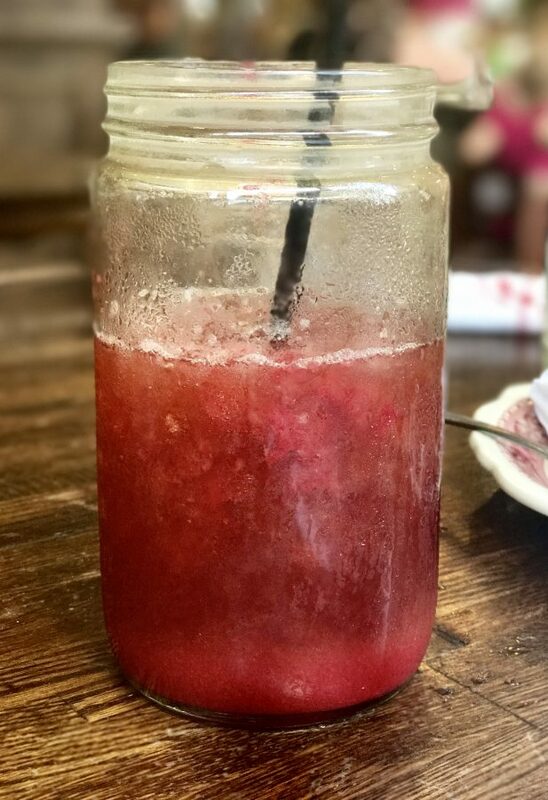 On a hot summer day, nothing quenches your thirst like a tall Mason jar filled with ice cold, fruit-flavored tea. The Mercantile menu includes a variety of fresh fruit purees in sweet and unsweet teas as well as in lemonade. I especially loved the blackberry tea served over pellet ice. 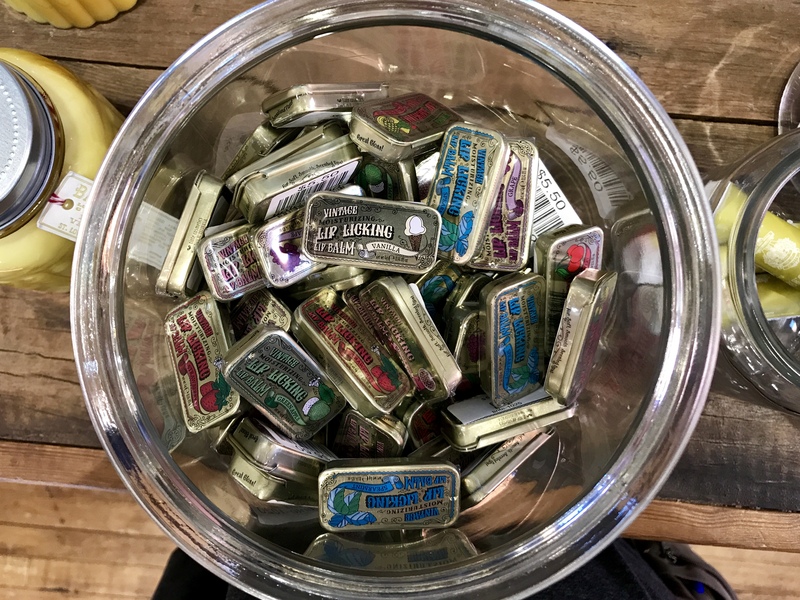 Vintage lip balm at The Pioneer Woman Mercantile in Pawhuska, Oklahoma. When I saw this vintage lip licking lip balm in a glass jar at The Merc, it took me back to my childhood! I remember having these lip balms stuffed down into my back pocket in elementary school and collecting all the flavors, including my favorites, bubblegum and root beer. I loved the little metal containers and sliding the top back and forth during class. And for $5.50, I took home a wonderful memory. Tiny bowls at The Pioneer Woman Mercantile in Pawhuska, Oklahoma. Do these make you happy, or what? 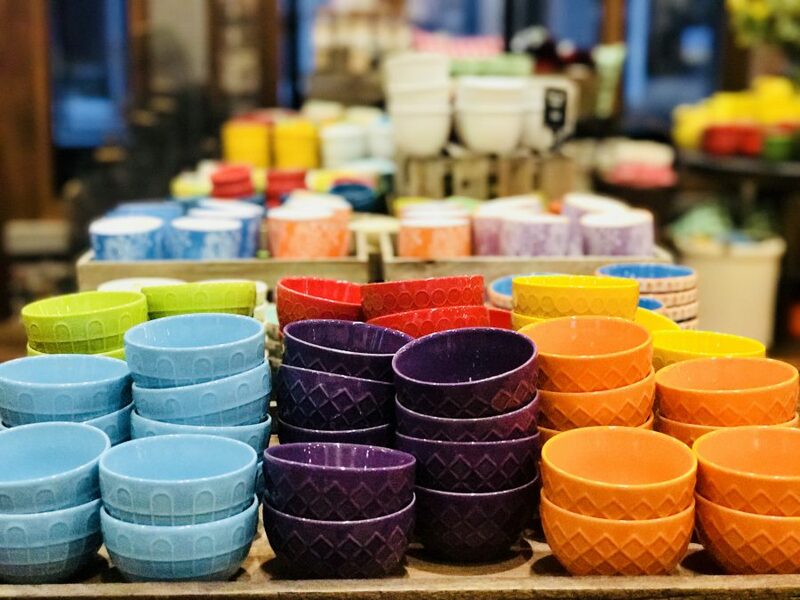 I love the plethora of tiny, colored bowls at The Mercantile. So many pretties in every color of the rainbow. There are polka dot bowls, mini spout bowls, nut bowls, berry bowls, and so on. I love all of the bright colors with their unique designs and every time we go there, they seem to have a new tiny bowl to tempt me. These bowls are great for entertaining, filling with salt and pepper for easy access near the stove, and for holding jewelry on a dresser. The prices at The Pioneer Woman Mercantile are very reasonable. One thing we really love (and appreciate) about The Pioneer Woman Mercantile is the prices. We know that The Pioneer Woman brand is huge and the Drummonds could charge and arm and a leg for their food and goods but they don’t. At least to us, most things were very reasonably priced. You can get the Farmer’s Breakfast including eggs, potatoes, ham, bacon, and house made sausage with a fluffy buttermilk biscuit and berry jam for only $10. Salads and sandwiches range from $7-15, while the most expensive dinner entree on the menu is the Cowboy Steak Dinner for just $24. I don’t know any other place you can get as good a 12 oz. USDA Choice ribeye steak with a twice-baked potato and green beans for that kind of money. And that queso dip appetizer for $8? Worth every penny — and every calorie. Have you been to The Pioneer Woman Mercantile in Pawhuska, Oklahoma? What did you love most about it? I can’t wait to go! And you are so right about that plastic wrap! I ordered it off the website and it is the best thing since sliced bread!!! Let us know how you like it! We’d love to hear from you. All your articles on the Pioneer woman just makes me excited to go there in August. Thanks so much.